This family wanted built-in bookshelves and cabinets made of grey-washed rift white oak, with plenty of storage for books, videos, and AV equipment. The ladder, which was on a rod, could be used for reaching the top cabinets and shelves. Long term storage would be on top to take advantage of the high ceilings. We opted for more closed storage rather than open storage, because there were a lot of kids' toys that could clutter up the space. These bookcases were for a rental apartment, but the client had committed to staying a long time and making it a home. 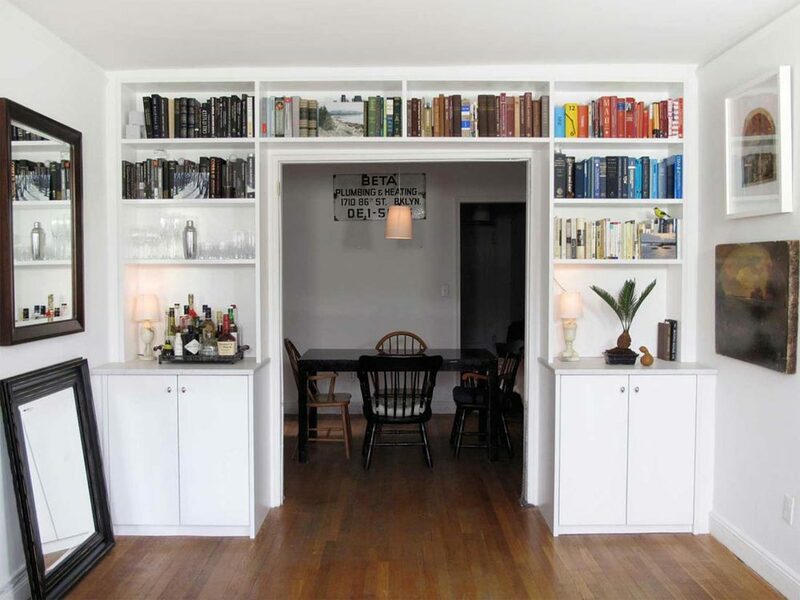 He had read an article in the New York Times about organizing books by color, and wanted built-ins for the books to frame the entryway, along with a marble-counter bar. After measuring some of the items he would be putting at the bar, these built-ins were made to create a welcoming passageway from the living room to the dining room. Custom shelves for the home office of a well-known graphic designer. This apartment was also featured in an interview article with the designer. This built-in shelf was made to fit all the client's books and AV gear. See the matching custom bed with hidden storage for this space.